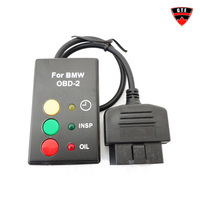 "This tool works really well on OBD II equipped BMWs. I use this on my 2003 e46. Simply plug it in, and turn the key to acc (gauges and such on but no ignition). Press the button you want to reset then the lights will all turn on. Unplug and turn key to off then back on. Should be reset at that point."